Karl Barth (1886-1968) has been called the most important Protestant theologian since Schleiermacher. A lifetime of work produced a complex body of writings that emerged both from his theological teaching and from his engagement in church life. The publication of some of his work posthumously has invited fresh and attentive interpretations of his thought. ;This book draws together these readings to provide an introduction to the main themes in Barth's theology. It shows the continuity and coherence of Barth's work, and stresses the importance of his biblical and ethical writings alongside his systematic theology. The book opens with a study of Barth's ethical thinking in key writings from the period of his break with theological liberalism. It then goes on to highlight the moeal anthropology set out in his lectures on ethics from the end of the 1920s. Webster studies the themes of original sin, hope and freedom in Barth's Church Dogmatics, illustrating Barth's concern to prove that divine grace shapes and restores human agency. He also explores the theme of missionary activity of the church in relation to Barth's remarkable treatment of the prophetic office of Christ, and draws a contrast between the moral anthroplogy of Bart and Luther. In conclusion, he focuses on Barth's response to modernity, postmodernity and the tasks of theology. - Publisher A collection of readings that provide a clear & authoritative introduction to the main themes of Barth's theology. - Publisher This series offers a range of authoritative studies on people who have made an outstanding contribution to Christian thought and understanding. The series will range across the full spectrum of Christian thought to include Catholic and Protestant thinkers and to cover East and West, historical and contemporary figures. By and large, each volume will focus on a single "thinker", but occasionally the subject may be a movement or a school of thought.^Karl Barth (1886-1968) has been called the most important Protestant theologian since Schleiermacher. His lifetime of work produced a huge and complex body of writings. The posthumous publication of much of his work has invited fresh and attentive interpretations of his thought.^This book draws together these readings to provide a clear and authoritative introduction to the main themes of Barth's theology. The closing chapter with its focus on Barth's relationship to modernity, postmodernity, and the tasks of theology will be especially useful tostudents. About "Barth (Outstanding Christian Thinkers Series)"
A collection of readings that provide a clear & authoritative introduction to the main themes of Barth's theology. This series offers a range of authoritative studies on people who have made an outstanding contribution to Christian thought and understanding. The series will range across the full spectrum of Christian thought to include Catholic and Protestant thinkers and to cover East and West, historical and contemporary figures. By and large, each volume will focus on a single "thinker", but occasionally the subject may be a movement or a school of thought.^Karl Barth (1886-1968) has been called the most important Protestant theologian since Schleiermacher. His lifetime of work produced a huge and complex body of writings. 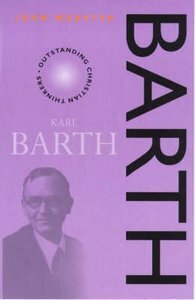 The posthumous publication of much of his work has invited fresh and attentive interpretations of his thought.^This book draws together these readings to provide a clear and authoritative introduction to the main themes of Barth's theology. The closing chapter with its focus on Barth's relationship to modernity, postmodernity, and the tasks of theology will be especially useful tostudents. Order now to secure your copy when our stock arrives. Other edition is available. 9780281076116 0 Available. Expected to ship in 6 to 7 weeks from Australia.